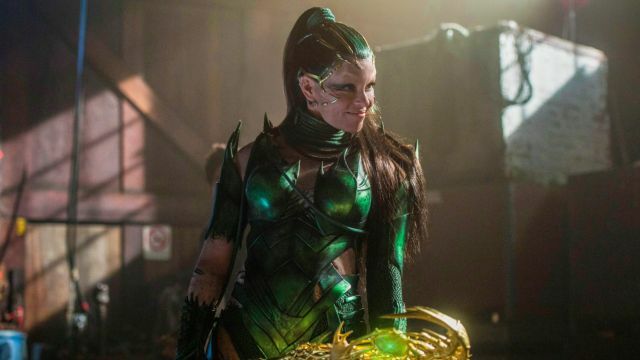 Lionsgate has released another photo from the new Power Rangers movie featuring Elizabeth Banks as the series villain, Rita Repulsa. Check it out in full below! The Power Rangers cast includes Dacre Montgomery (A Few Less Men) as Jason the Red Ranger, RJ Cyler (Me and Earl and the Dying Girl) as Billy the Blue Ranger, Naomi Scott (The 33) as Kimberly the Pink Ranger, Becky G (Empire) as Trini the Yellow Ranger, Ludi Lin (Monster Hunt) as Zack the Black Ranger, with Bill Hader (“Saturday Night Live) voicing Alpha 5, and Bryan Cranston (“Breaking Bad,” Godzilla) as Zordon.